On Tuesday, the School Board made a somewhat late call to cancel school. It felt even later than normal because we all got a call early Sunday evening schools would be closed on Monday due to the extreme cold. On top of that, the roads were pretty good at 5:30 when some folks in the eastern part of the county were leaving for work. Recall that we had some precipitation over the weekend and that it was super cold on Monday. Many roads in Western LoCo never see sunlight and were still iced over despite the rain. It was bad enough for VDOT to tell the County their trucks were sliding off the road and to recommended closing school. Now I admit, when we lived in Leesburg there were many days I would question schools being closed because our roads were clear. And to be fair, after someone who lived in western LoCo commented his road was a sheet of ice, the tone changed and was a little more understanding. 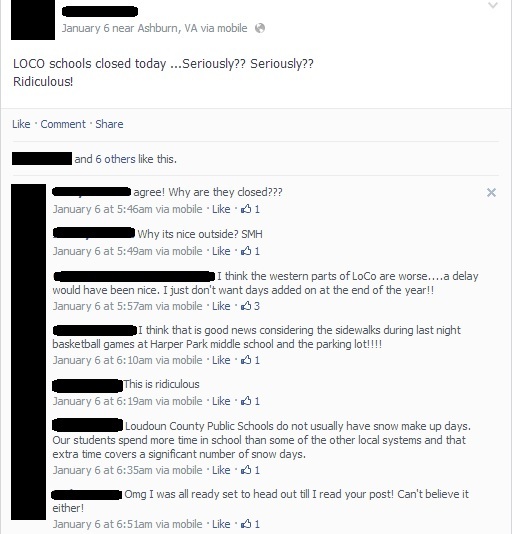 This was one of many threads I read from people who were very upset about schools being closed. WTOP Radio posted this video, watch it and tell me if you think the right call was made. I spoke with the LCPS Public Information Office this morning and was told the principal at each school does have the discretion to make those absences excused. We were also told there is currently no discussion concerning closing only a portion of the schools due to hazardous conditions and if that was an area we wanted to pursue we should contact our local School Board Member (you could do that here). One of the great things about living in Loudoun is our variety of lifestyles. 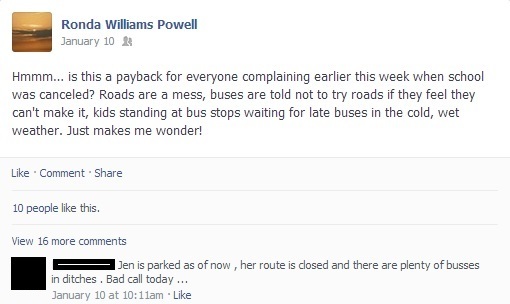 It also makes issues like this so tough because of the drastic difference in road conditions. I can see both sides, and perhaps having the ability to close a portion of the schools should be considered. Not sure what the answer is, but I know keeping our kids safe should be the main priority. Maybe I’m crazy, but I enjoy the snow days. Before too long my kids will be gone and there won’t be any more.